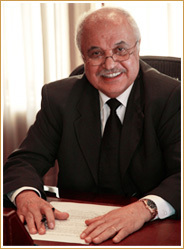 The Talal Abu-Ghazaleh Global (TAG.Global) prides itself on the relationships and services that it has developed over more than 30 years of service in the Arab world. We have built strong mutually supportive relationships with the world's leading financial and development organizations -- the United Nations, the World Trade Organization, the World Bank, the International Chamber of Commerce, and so many others. Across Europe and North America, we have hundreds of clients, associates and friends, and we present to them the image of the Arab world as we know it should be presented: friendly, fair, professional and proud. We cherish our close relationships with Arab governments and business leaders across the region. Over the years, the services we offer have changed, as the world and our region did too. In association with the United Kingdom’s famed Cambridge University, we now offer the highest-quality information technology certification programs available in the Arab world. We have steadily developed our capabilities to keep pace with the needs and demands of Arab society and economy. Throughout all the years, we have focused most of all on the development of human capacity, beginning with our own professional staff, and on leveraging their expertise to enrich the Arab community. We have embraced the concept of the ‘knowledge worker’ and have sought to empower our people and the Arab world’s people to dream, to imagine, and to create. Despite the immense challenges that we have faced and continue to face, we refuse to indulge in negativity or pessimism. We are an organization that believes in empowering people to be their best. TAG.Global's core mission is to contribute to the socio-economic development of the Arab world. We do this on two levels. On the most basic level, we seek practical and effective solutions to the problems of our individual clients. On a more holistic basis, we conduct internal brainstorming and strategy sessions with our best consultants, addressing first the problems and then the solutions that need to be presented to the Arab business community. Unlike most other private sector firms, we don’t give primary weight to the bottom line (although staying in business is necessarily a goal), but, rather, we look at problems that we can address and solutions we can provide. A recent example of this process is the new consulting unit we have formed to deal with the unique problems facing family-owned businesses which dominate the private sector in the Arab region. Currently, a key group of our senior consultants is working on the development of a new division to develop open-source software applications in the Arab world. Perhaps one of the most significant issues we are currently addressing is environmental sustainability. This is an issue that has rarely been addressed seriously by the Arab business community, but is one of the most important issues we face in the mid-term. We are currently developing an ambitious strategic initiative in this area for implementation across the region, and this will provide benefits at both levels: for the Arab society as a whole, and for our clients and partners. We look forward to a future of continued growth, development and success. As we continue our march into this brave new millennium, there are many questions, fears, and challenges. TAG.Global will be here for our clients, working to meet the Arab world’s business requirements in a dedicated spirit of cooperation and service.